Choosing an engagement ring that embodies your unique style, feels timeless, and suits the kinds of activities you engage in on a daily basis can be challenging enough; on top of these considerations, I also see ring shoppers worry about whether they will find a wedding band that sits flush with the engagement ring. When my customers get brow-furrowingly concerned about it, I like to remind them that this decision is like any other they have made in their relationship: Be true to your style and values, and the rest always falls into place. Choose the engagement ring of your dreams, and the wedding ring will work itself out—and we’re here to make sure of it! The first step to choosing a closely fitted wedding band is determining whether your engagement ring can sit flush with a straight wedding ring. 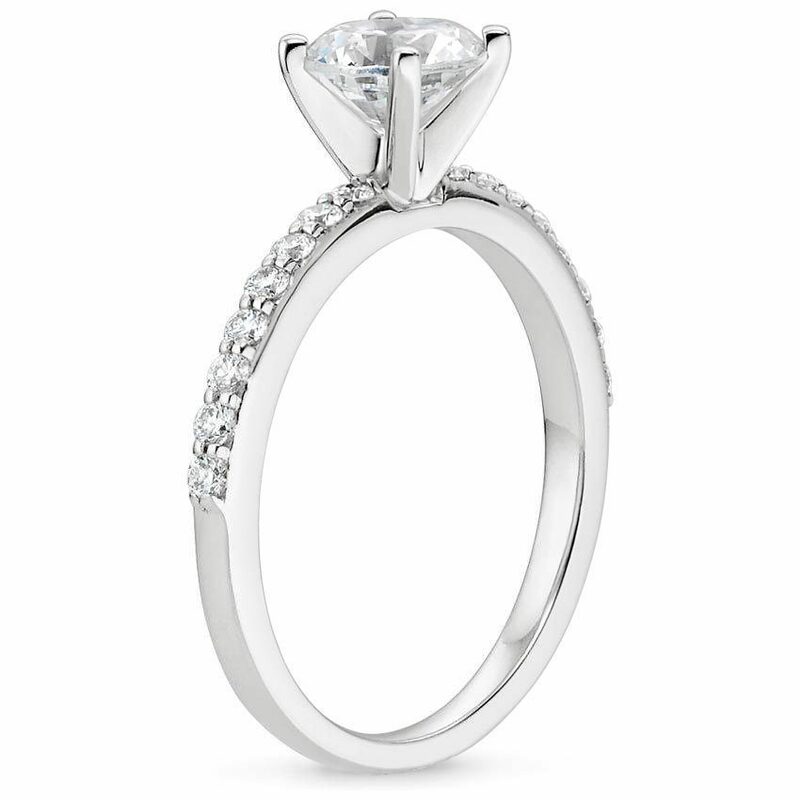 Many classic engagement ring styles are already designed to sit flush with a straight band. 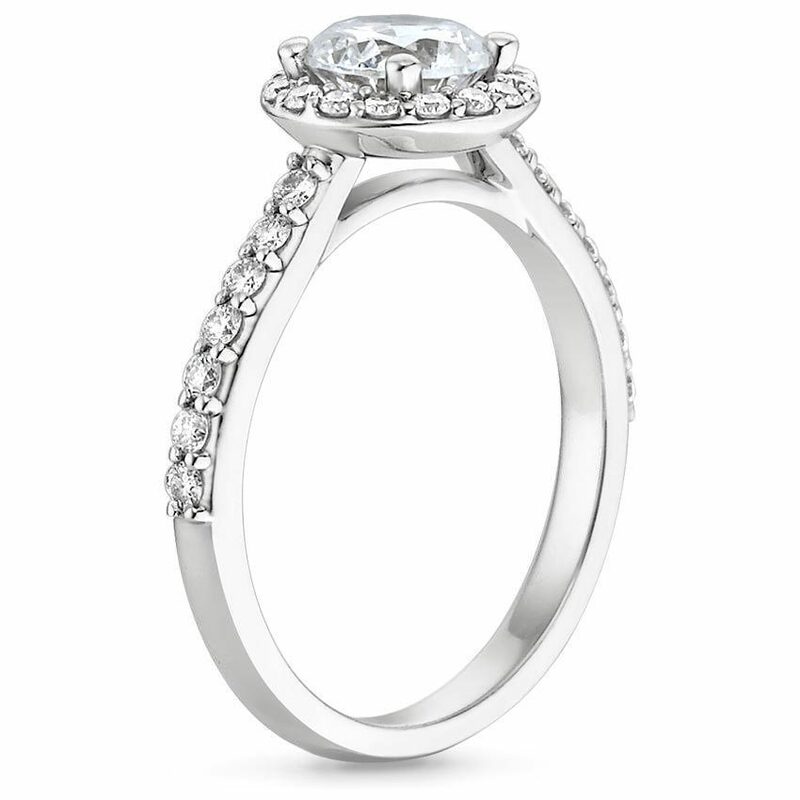 Look for an elevated head that allows the center gemstone to sit above the band, like in the Petite Shared Prong Diamond Ring and the Halo Diamond Ring with Side Stones. These styles and similar designs offer the simple option of pairing with a straight wedding band for a close fit. 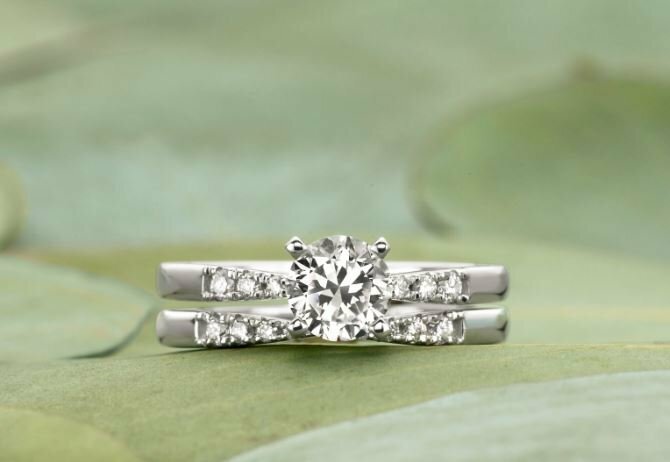 In addition, many Brilliant Earth engagement rings can be purchased as part of a matched set that includes a perfectly coordinated wedding band. But if your engagement ring has an elaborate shape that requires a custom fitted wedding ring, just contact our custom design team—we are happy to help you explore designing a custom piece! 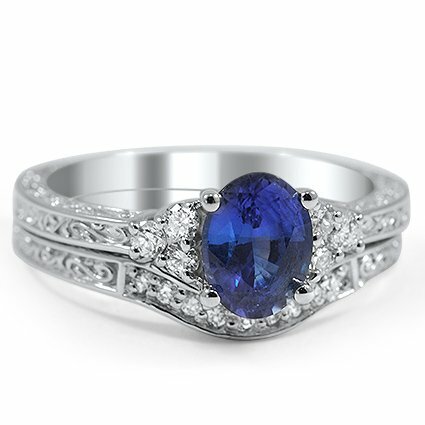 There are a few jewelry design techniques that allow a wedding band to sit flush with the engagement ring: Contouring, notching, and a contouring and notching combination. 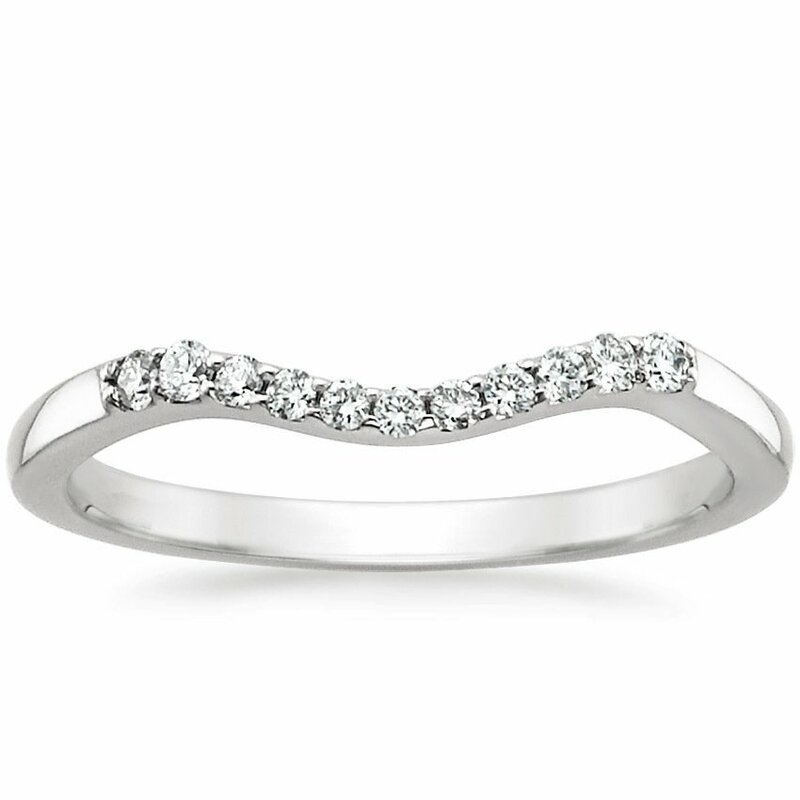 A contoured wedding band is designed to match the curvature of your engagement ring. 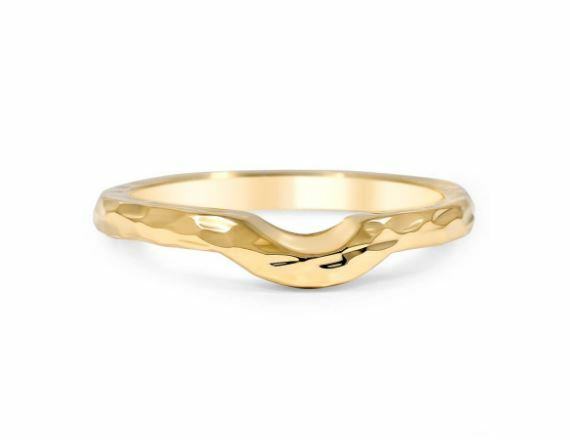 Most frequently, that means a contoured band is shaped at the front to follow the contours of your engagement ring, and then straight in the back. 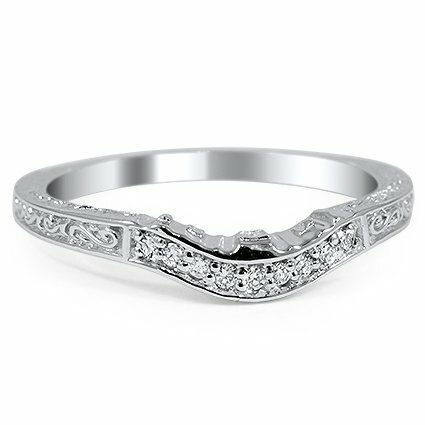 Contouring is the most common technique for flush wedding ring design, and elegantly accommodates a wide range of engagement ring styles. The Chamise Matched Set above is one sought after example of this option. A notched wedding band is a great option, but keep in mind that the wedding ring must be wide enough to safely accommodate a notch. The custom design above is a classic example of this style. 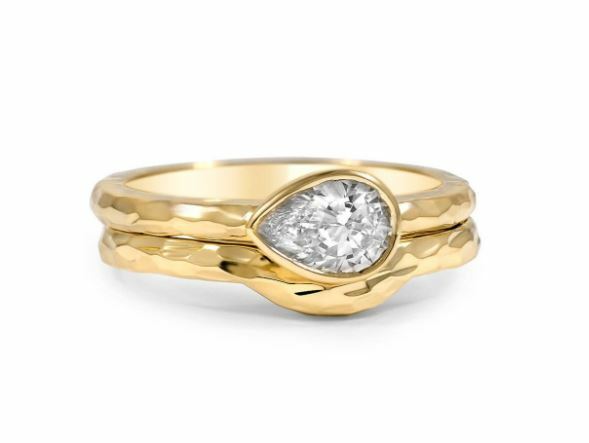 If your engagement ring both has a dramatic, elongated shape (which might be the case if your center gemstone is an oval, marquise, or emerald) and there are very fine details around the center gemstone, your wedding ring may need to be both contoured and notched to create a beautiful close fit. A contoured and notched wedding ring will follow the overall shape of your engagement ring, and additionally have notches in the contoured band that allow the engagement ring’s finer details to sit perfectly against it. The custom design above is a beautiful example. 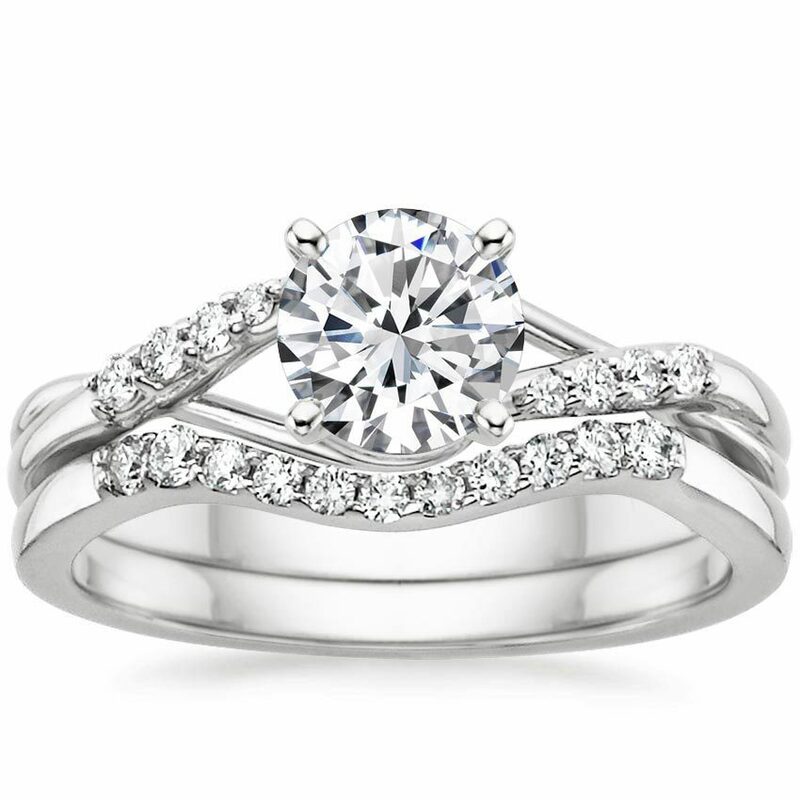 Your engagement and wedding rings will fit together beautifully with minimal gap between them. The look of the two complementary rings is breathtaking! If you’ve had trouble with your engagement ring spinning on your finger before, then a flush wedding band style can often help keep your engagement ring more securely in place. Since you plan to wear these two rings for the rest of your life, the extra effort of the custom design process will likely be well worth it. In order to create a perfect fit, our jewelers need to keep your engagement ring on hand for 4-8 weeks while we create your wedding band. We know it can be difficult for a soon-to-be bride to part with her engagement ring, which is why we offer insured and prepaid shipping both ways to help you rest easy. A custom designed wedding ring is not eligible for Brilliant Earth’s complimentary return, exchange, or resize policy, but its quality and craftsmanship is guaranteed under our Lifetime Manufacturing Warranty. One potential style concern with a contoured or notched wedding ring is that it may be harder to wear when you take your engagement ring off (when you’re traveling or exercising, for example). Because the wedding ring is designed with a complementary ring in mind, some women feel like something’s missing when worn on its own. Other women don’t mind the look at all, or simply turn the contoured or notched section around to show the straight back of the ring when wearing the wedding ring alone. Finally, while the stacked, flush-fitting engagement ring and wedding band have become something of a modern tradition, don’t forget that we are making our own traditions all the time! If a straight wedding ring does not sit flush with your engagement ring, yet you aren’t drawn to a contoured or notched band either, consider wearing your two rings on separate hands. Alternatively, stack the rings on the same ring finger, but wear them with a gap. Either of these approaches recognizes that each of your rings has its own distinct personality, and deserves individual attention. If you have questions about the best wedding band to pair with your engagement ring, contact a Brilliant Earth representative for personalized assistance. We’re excited to help you create a beautiful match! Very nice Web viewing pages! I also enjoyed reading the “Time Articals & Blood Diamonds, School Education, etc. !” Very good information all around. Thank you for educating them as well as the rest of us reading the Web page! ???????? It is also fun to look at all the new beautiful Ring & Jewerly designs out there! Very talented artists! ? ?